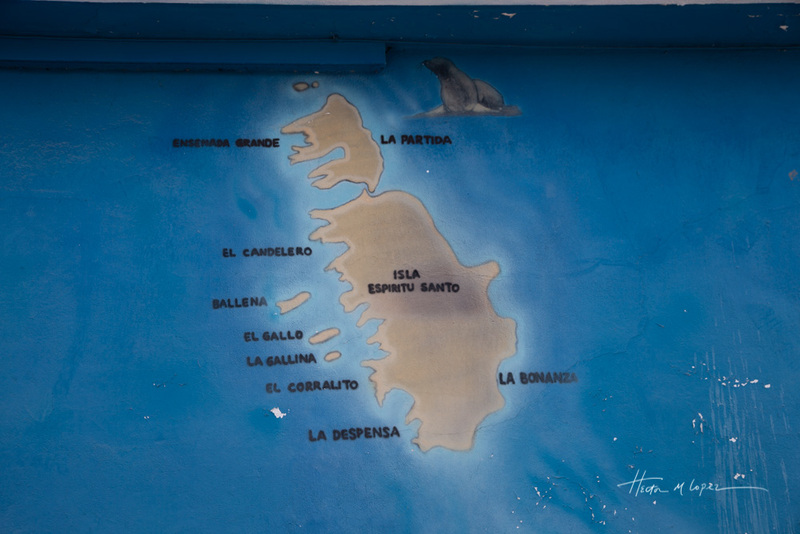 The tour from La Paz to Isla Espíritu Santo is one of the boat tours that we’d read about and signed up for. 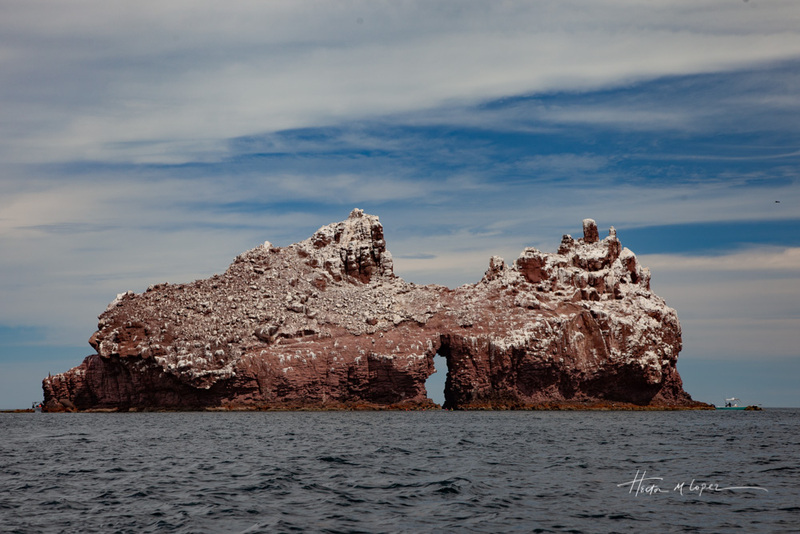 It’s about six hours long and takes you across to the beautiful island that is rich with marine life. It took a long time to cruise over to the island and the anticipation was high. 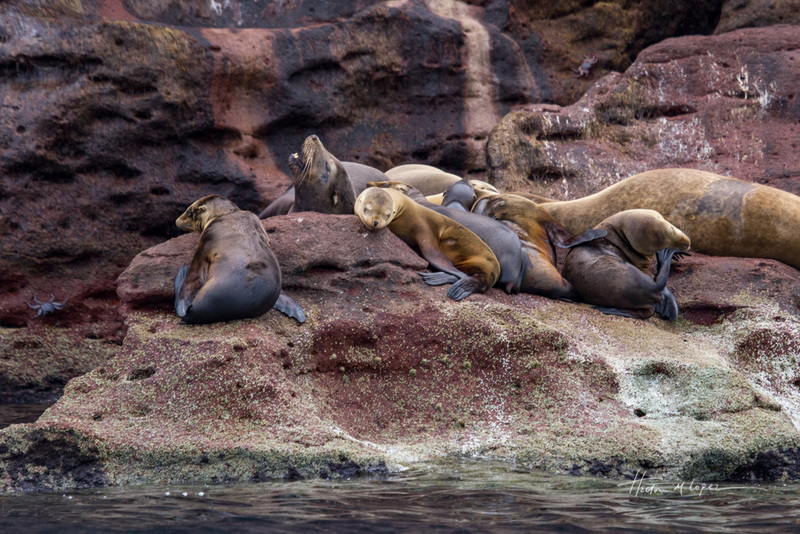 After a long boat ride, we finally reached the largest sea lion colony in the Sea of Cortez, Los Islotes, an island inlet at the north end of the island. 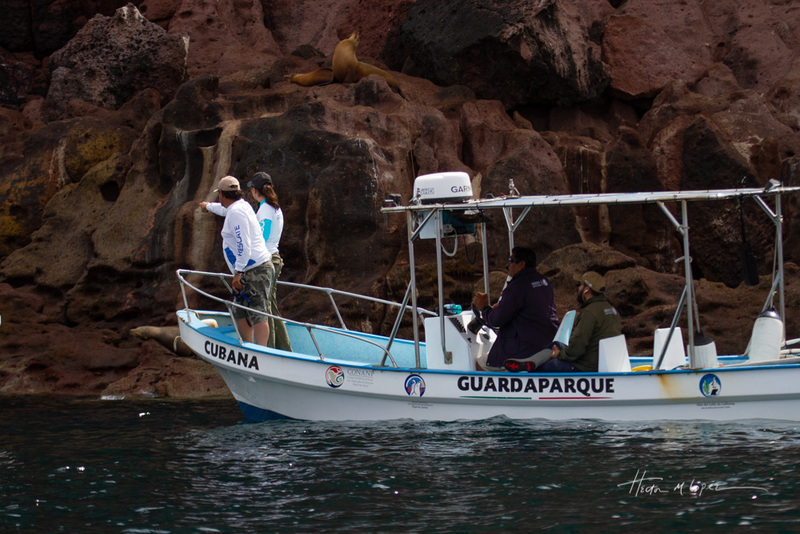 When we reached the colony, one of the the park rangers was leading a rescue of a sea lion that had been caught in a net. They didn’t allow us to stick around so we continued. 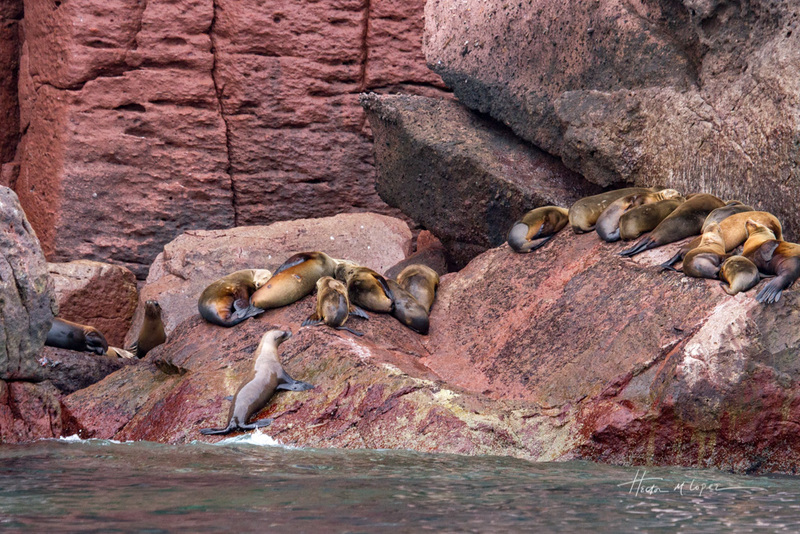 There was an area on the island closed to snorkeling they called the “kindergarden” where there were lots of sea lion cubs laying around on rocks including juveniles, adults and huge males. 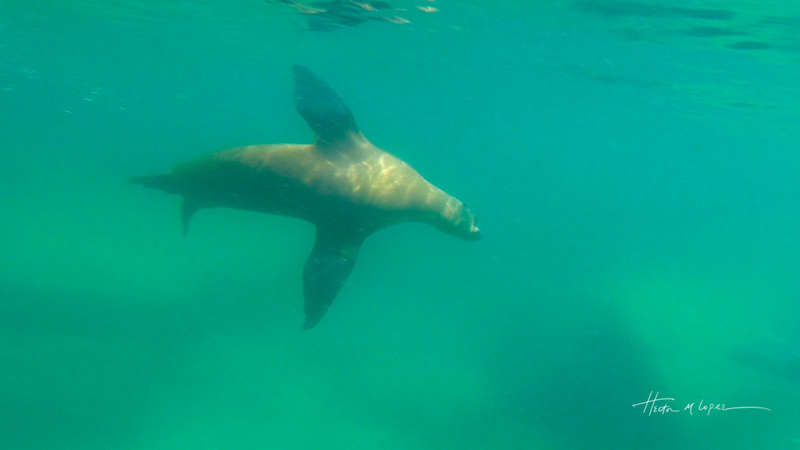 I had snorkeled with sea lions before, and they can be quite curious and cute, in some cases swimming right up to people, so I was excited. 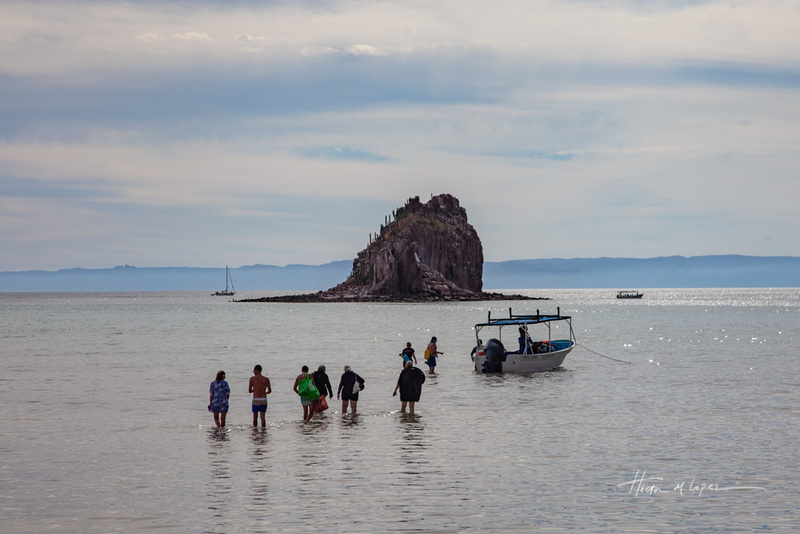 We bought new wetsuits and snorkel gear last year just for the Sea of Cortez but I was still worried about jumping into the cold (68 degree) water. 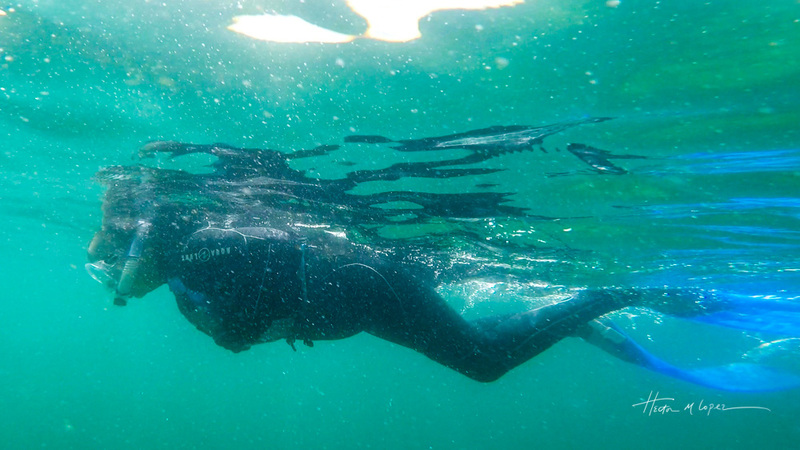 But my new 3mm wetsuit did its job and I was comfortable. 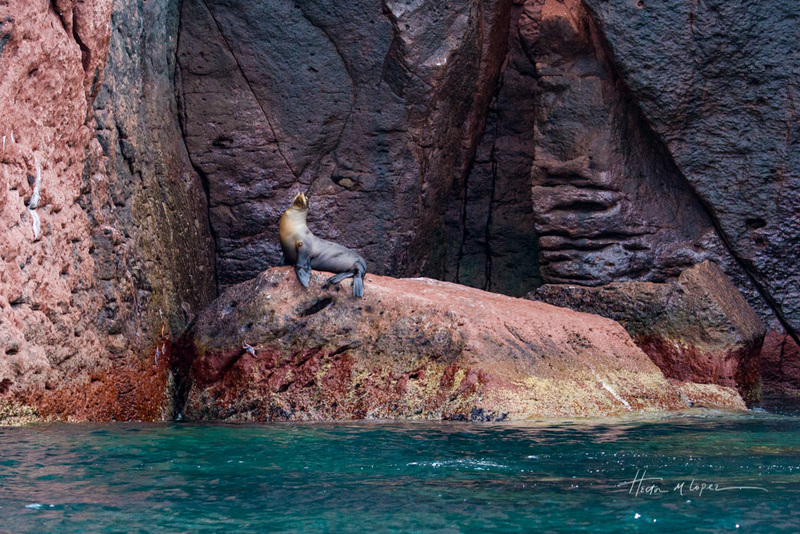 We snorkeled for about half an hour and during that time only a few sea lions decided they wanted to be in the water with the humans. It wasn’t quite the sea lion experience that I had hoped but a few swam near us in the water and one swam between Hector’s legs. There were lots of tropical fish in the water, a beautiful reminder of our scuba diving days. 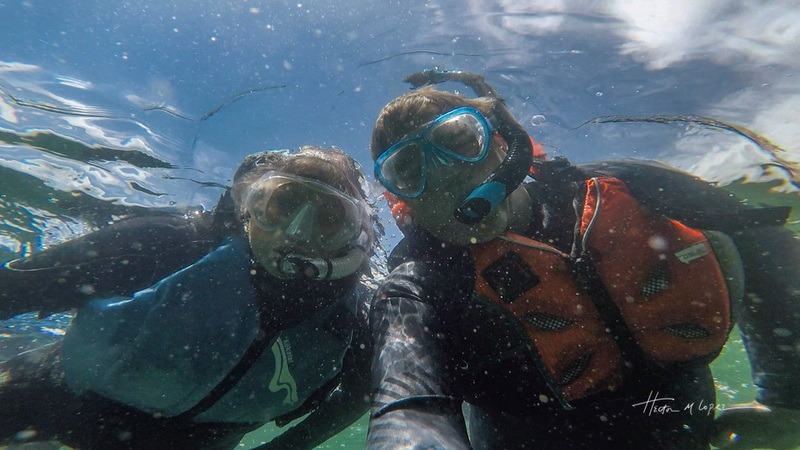 We look forward to returning to some diving sometime soon. 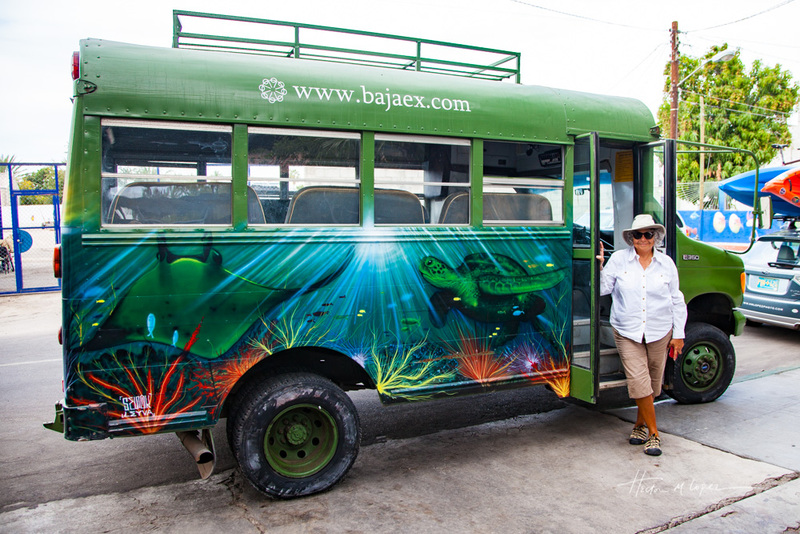 Next we cruised to the center of the island to a campground that’s run by our tour’s organization. 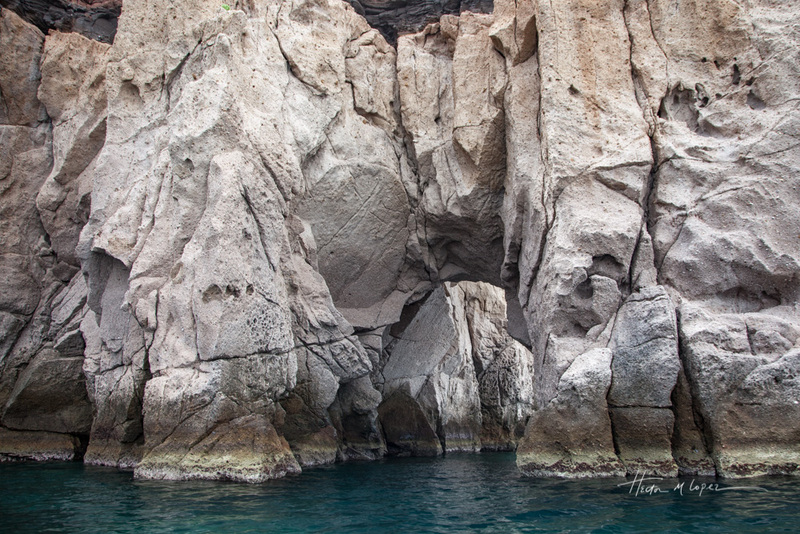 On the way we saw lots of impressive rock formations. 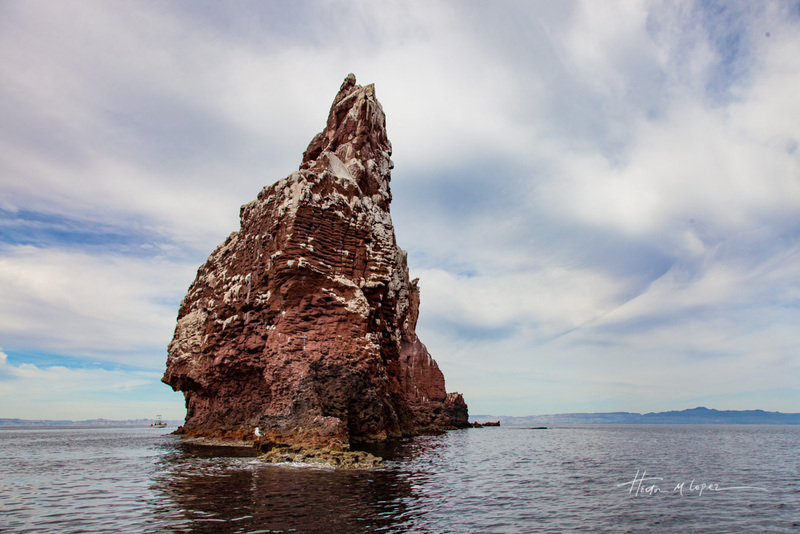 As we passed through an opening in one, the guide pointed out a part of the rock that was shaped just like the Baja Peninsula. Very cool! Then we watched a pod of dolphins as they frolicked in the water. The campground was on a pretty beach with some tents and a compost toilet. This time of year is too cold at night for me to tent camp, but it looked like a sweet place to spend a few days. We spent a couple of hours on the beach. 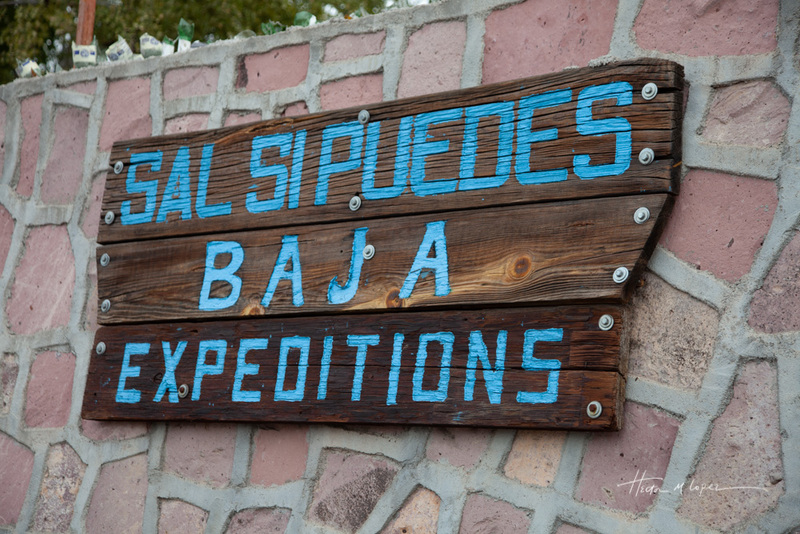 The guides served a nice lunch of ceviche, bean burritos, guacamole and tostadas and we took it easy for a bit. 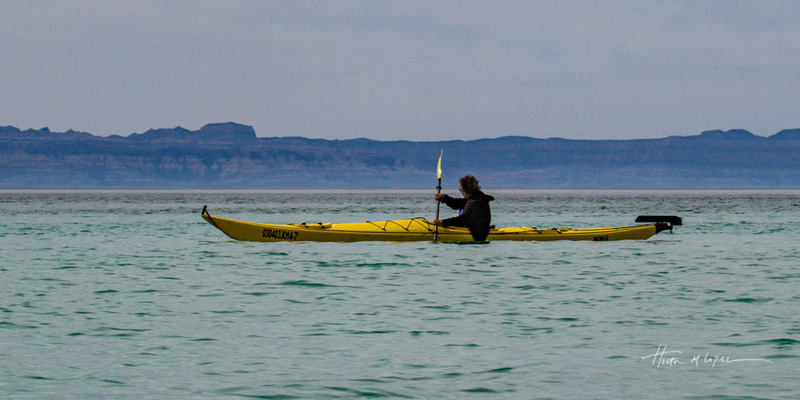 They had kayaks and SUPs available so we took two kayaks out. Unfortunately, they were old kayaks with seats whose back was really loose. They were uncomfortable so we didn’t take them out as far as we had hoped to which was a disappointment. 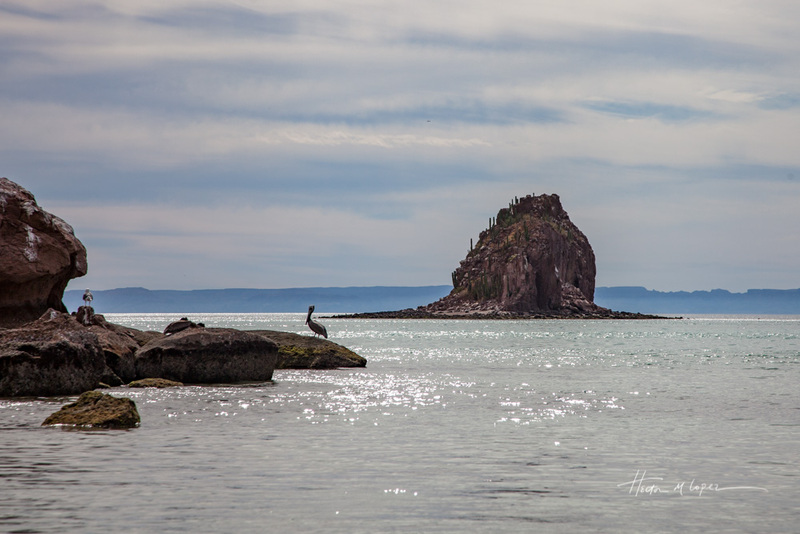 But we did get to a couple of rock outcrops nearby where there were lots of birds, including Hector’s favorites, the pelicans. Back on the beach, we walked around for a bit along with some others. 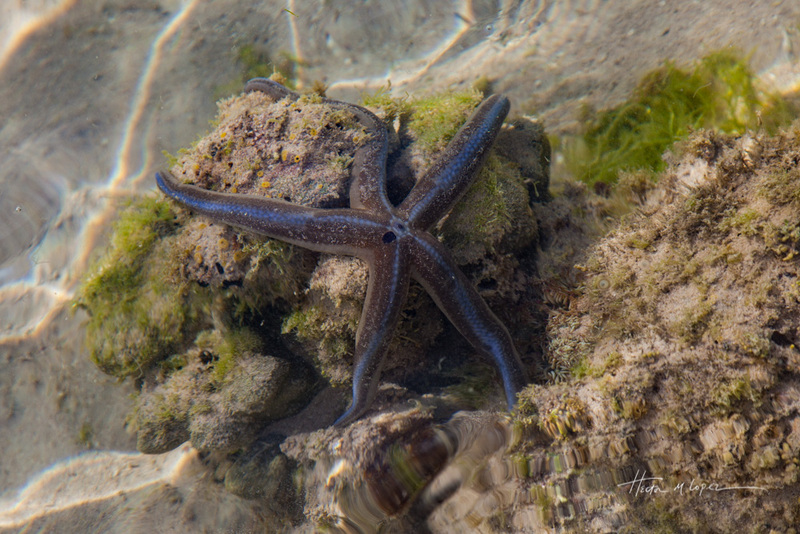 The water was crystal clear and some ladies spotted a huge sea star that we ran over to look at. So beautiful! 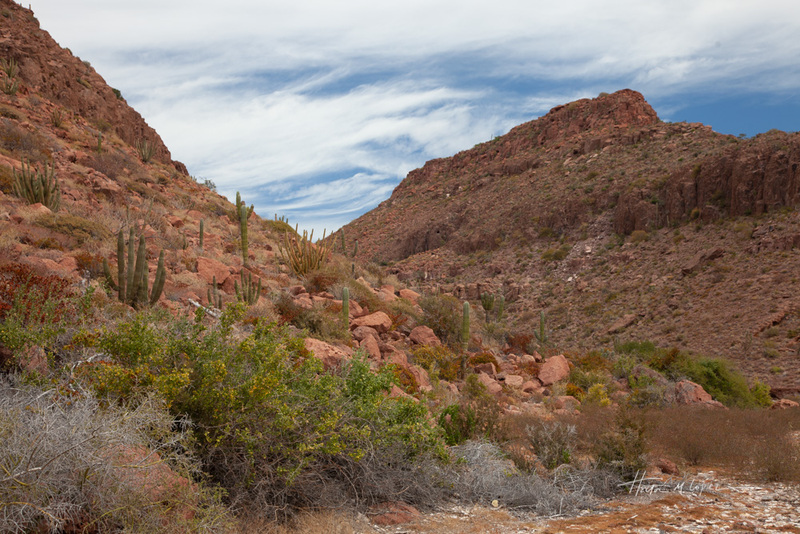 The island was covered in beautiful desert vegetation. It looked like a great place to hike. 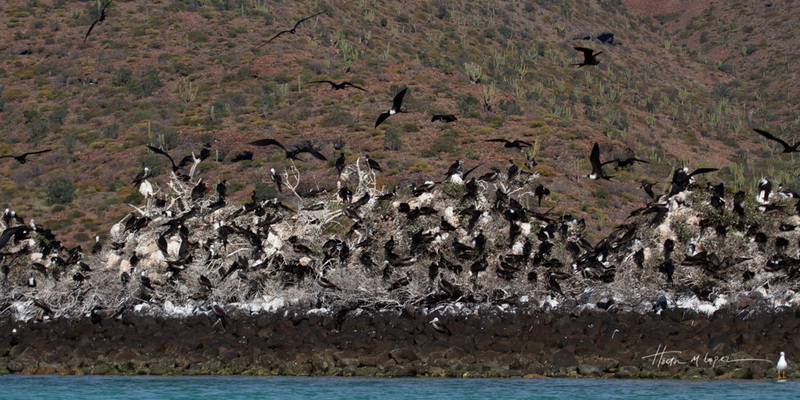 After our time on the beach, we headed back out towards the other end of the island where there is a frigate bird colony. 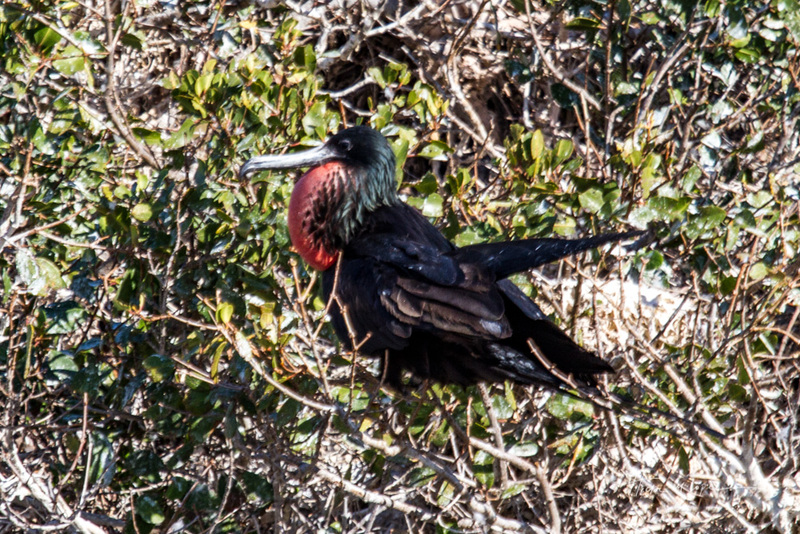 We’d never seen frigate birds on the ground, apparently they can’t walk, they can only perch and fly. They also can’t land of the water, so they have to pluck their fish out of the water. 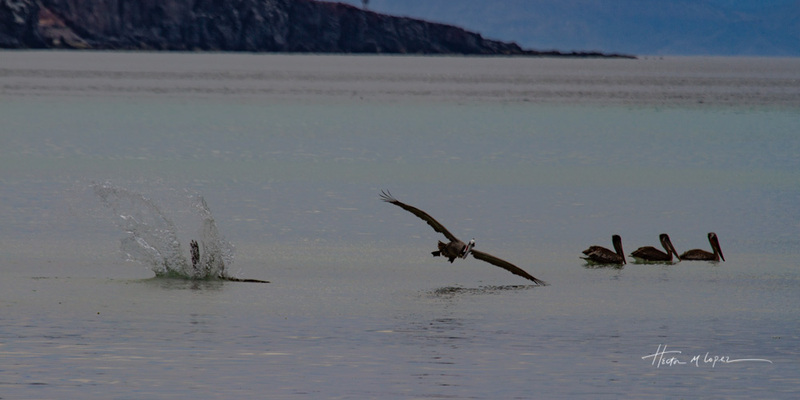 Some of the males were in full display and there were lots of juveniles with their white heads. 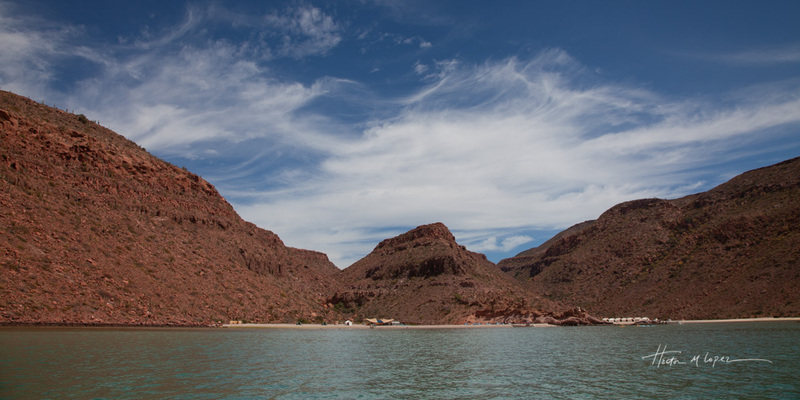 This area also had the ruins of a pearl farm that’s part of the history of La Paz. Very cool. I told the guide that I was interested in seeing blue footed boobies and he said they were not normally on the tour. 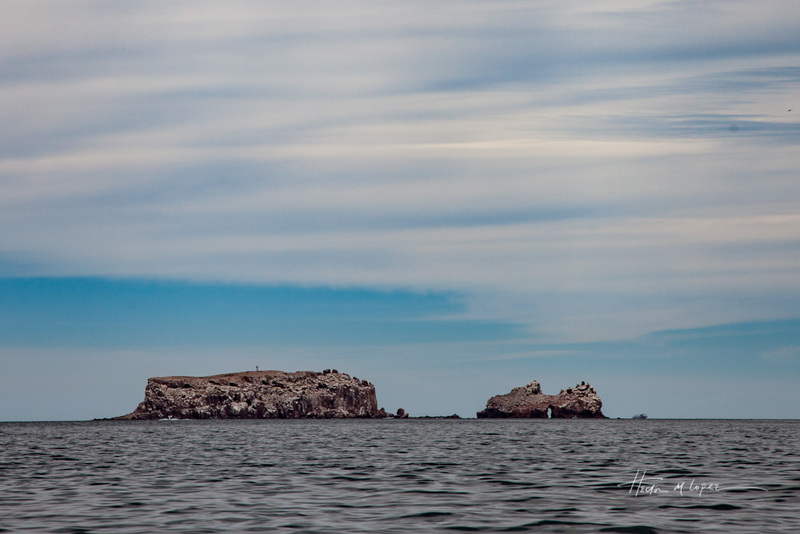 But he asked the captain to go by a smaller island where they sometimes perch, alas there were none there. On the last leg of our trip the captain spotted some whale sharks. 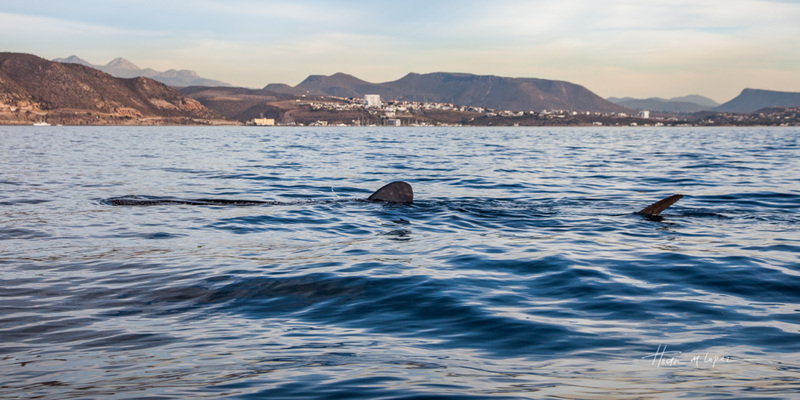 They were moving really slowly through the water while feeding so we got a really good look at their dorsal fin and their tails on top of the water. The captain got a bit closer and one of the whale sharks swam up to and right under our boat. A beautiful sight! That made up for not seeing the blue footed boobies. All in all a pretty good day on the water. 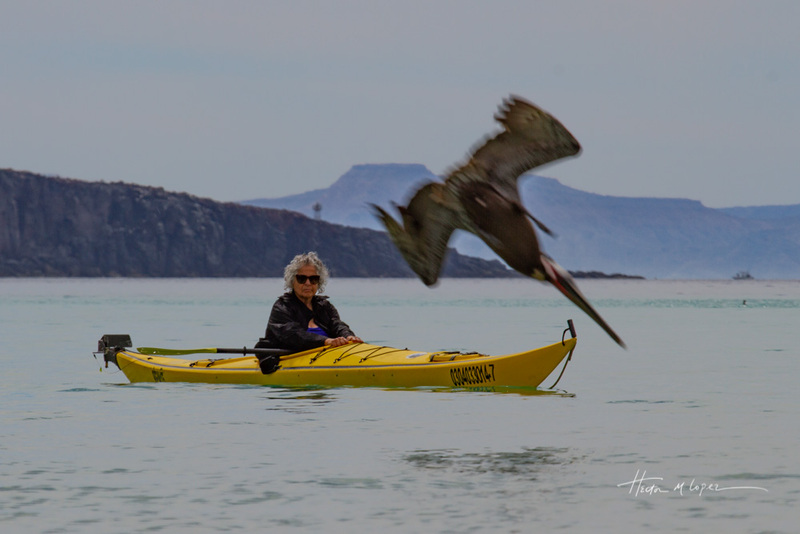 This entry was posted in Mexico and tagged beaches, birdwatching, desert, kayak, whales, wildlife by islandgirlwalkabout. Bookmark the permalink. 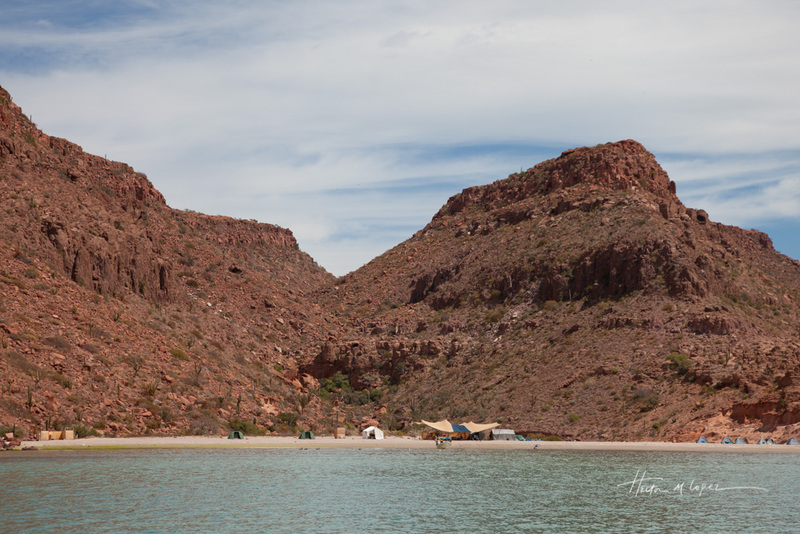 I know we discussed over dinner that we were on our way to do this, but it seems spending three nights on Espiritu Santo made all the difference, and the camp we were at wasn’t at all cold, even in a gale on our last night – maybe the cove we were in was less exposed? 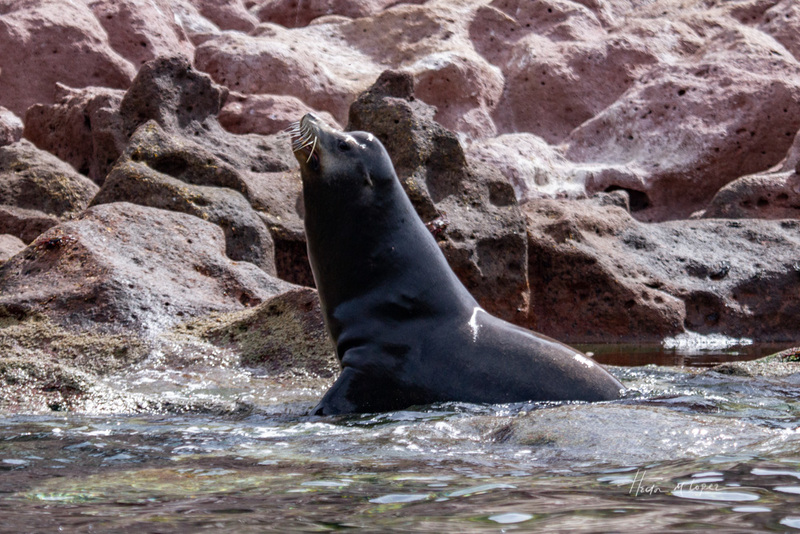 We had a marvelous encounter with the sea lions, one even took my hand in its mouth, like a puppy, and others in our camp went back for a second day of frolicking while Dave & I went for a kayak to Isla Ballena to see the pelican rookery. 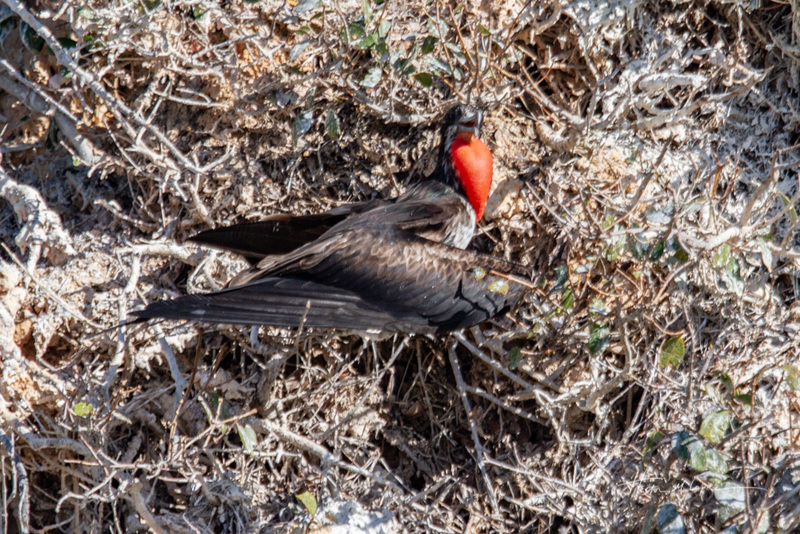 We, like you, also saw the frigate bird rookery – amazing, as are Hector’s photos! 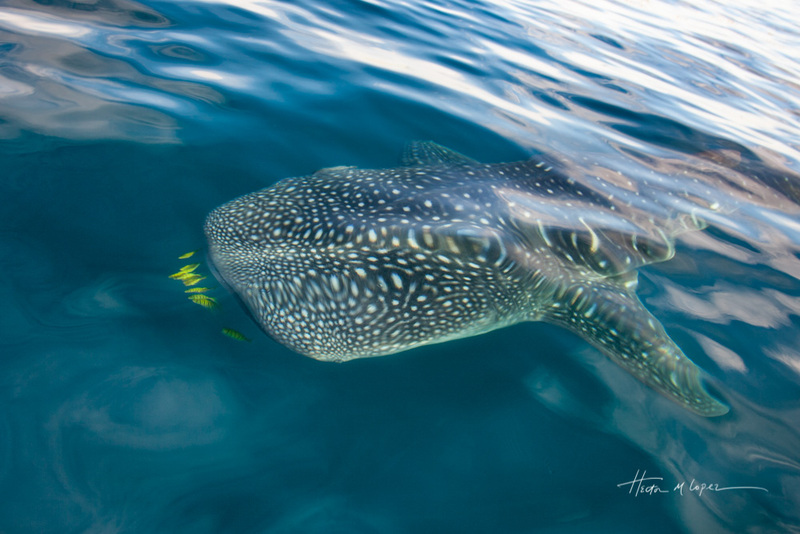 And photos of the whale sharks with the sergeant major fish swimming in front of them? Astounding! Kudos! Looking forward to more adventures from you! We saw the camp you were going to and it looked nicer than the one we visited. Great to know it wasn’t cold, although I’m a wimp for cold so it might have bothered me more than you. 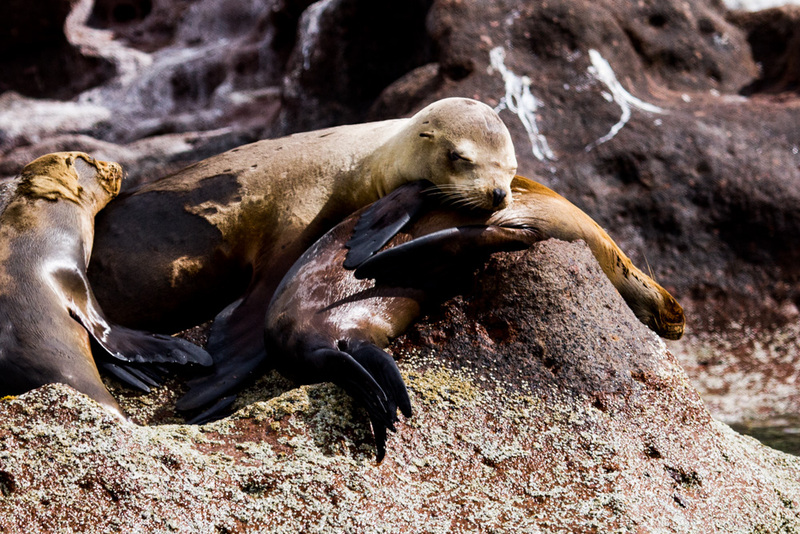 We heard about the sea lions biting like puppies, how cute is that. 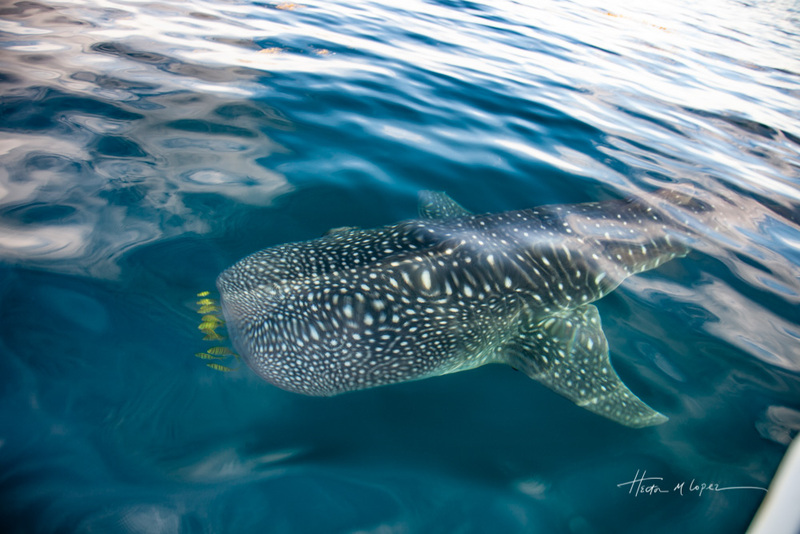 Our post on whale sharks is coming soon! 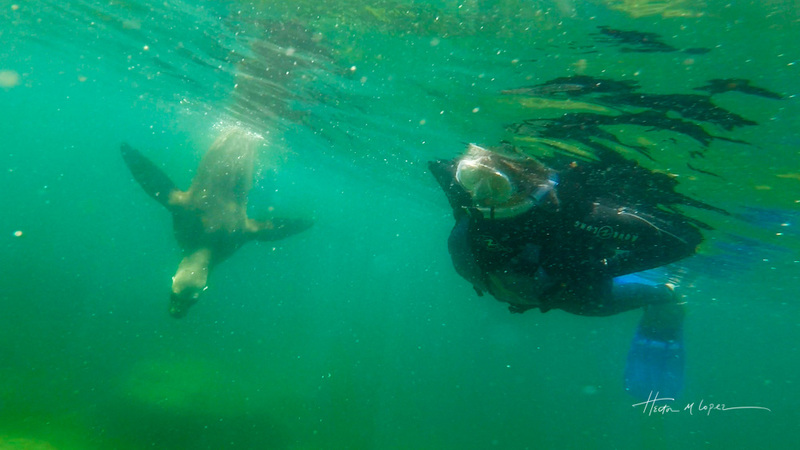 Adorable photo of the two of you snorkeling:) What a perfect photo of Brenda and the diving pelican! 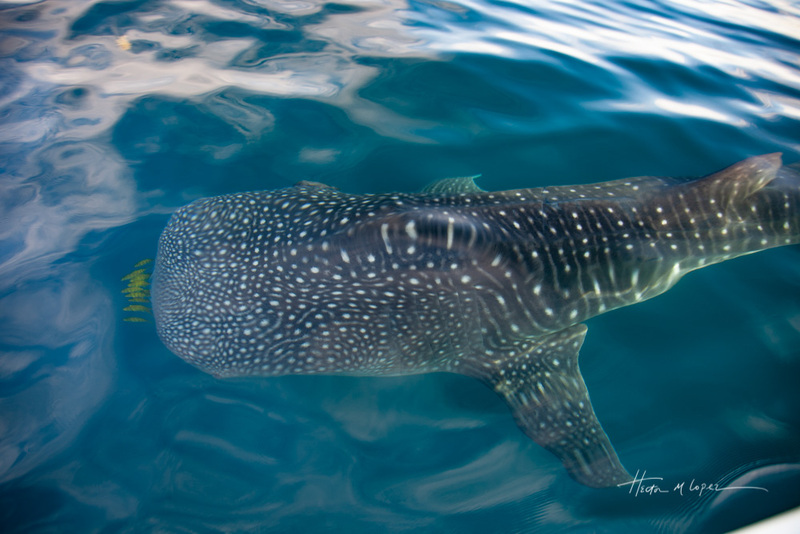 Love the whale shark photos. I am green with envy! 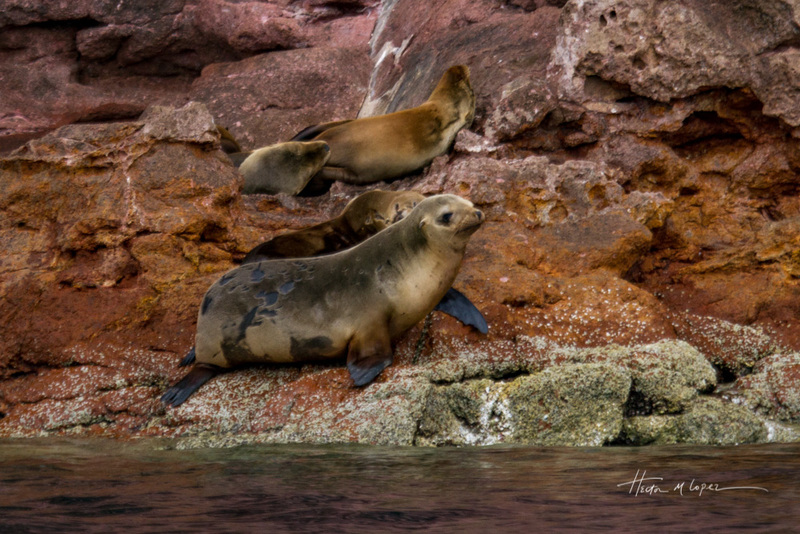 I love the sea lions. 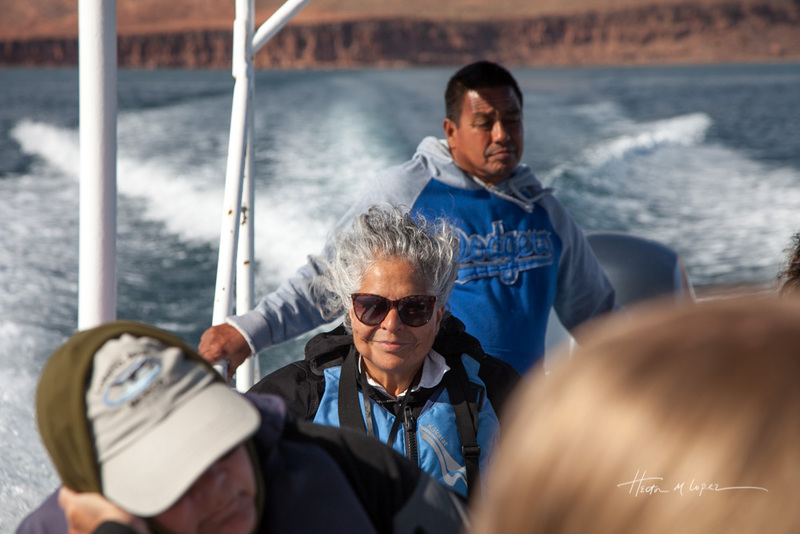 Those images took me back to our time in Patagonia. 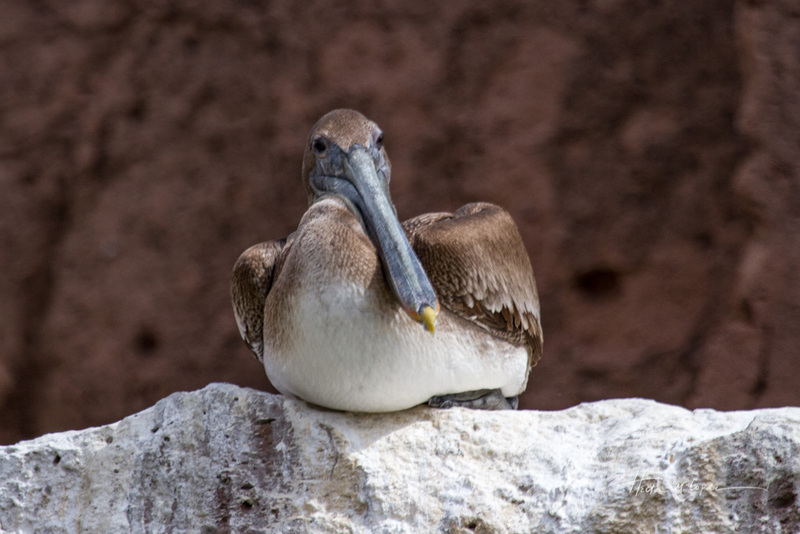 I also am enthralled with pelicans. Fabulous images!